Details: Ensure a great night's sleep while camping with the Super-Tough Airbed by Intex. Engineered with the Dura-Beam Technology, which is comprised of thousands of high-strength polyester fibers, resulting in amazing durability for years of lasting comfort, the Super-Tough Airbed provides enhanced comfort, stability and support. Unlike traditional airbed construction, high-strength polyester fibers do not stretch over time. This bed is ultra-strong, ultra-light and ultra-convenient, which is perfect for the Great Outdoors! 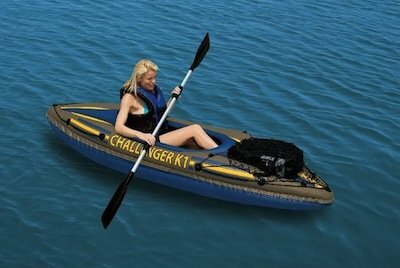 The smooth, puncture resistant surface and inner construction eliminates bumps for a refreshing night's sleep.The nimble, durable Challenger K1 kayak is made of durable welded material with eye-catching graphics for added safety on the lake or slow-moving river. The streamlined craft slips easily through the water, and its cockpit is designed for comfort and maximized space. Inflatable I-beam floors add stability, and an 84-inch oar and high-output hand pump are also included. The nimble, streamlined K1 is ideal for a day of fun on the lake or slow-moving river. Intex Recreation makes above-ground swimming pools, air beds, inflatable toys, pool and lake boats, and the proprietary Intex Saltwater Pool System. The company has been in business for over 40 years, and is a global leader in designing and producing innovative products for indoor and outdoor recreation. Intex products meet the most stringent safety standards, undergoing intensive testing to ensure years of safety and satisfaction. During the manufacturing process, trained Intex employees continuously monitor a wide range of factors, including quality of raw materials, calibration of the machines, manufacture and assembly of each product, product testing, and careful packaging of every item.